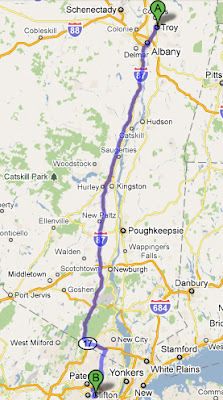 Drivin' down to NJ today! Today we are heading down to New Jersey for a double header with Suburbia Roller Derby against The Garden State Rollergirls. It's the Battle of the Bridge: NY vs. NJ! It should be an easy ride downstate. It should be about a three hour drive. The bout is a double header, so we'll be playing late and getting done late - so most of us are staying the night - Hellions party!! This is the last game of our Winter*Spring 2011 Season, which ended up being 6 bouts in total instead of 5 (we played Utica in April). We've had a great season so far and every team we played was amazing! We also introduced quite a few new girls this season. With the end of this season, we're headed right into the summer season! Our next home bout is Saturday, June 4 against the Skyland Roller Girls. The bout flyer from last year - May 8, 2010. I can't believe I missed my one year bout-aversary!! 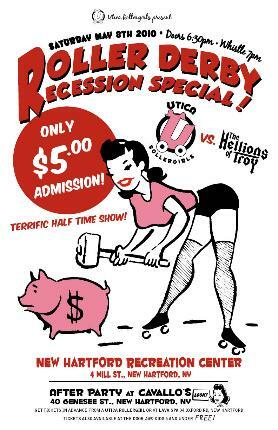 That is to say, my very first roller derby bout one year ago: May 8, 2011 against the Utica Rollergirls! Since then, I have played so much derby! I joined the Hellions in September 2009 - I am almost a two year veteran of the team. Tomorrow, when we play Garden State, it will be my 11th bout. One other interesting thing is that tomorrow, my boyfriend, "Massacre", who refs for the Hellions but also plays for the Capital District Men's Roller Derby league, will play in his first bout ever!